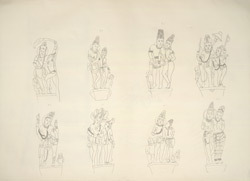 Pen-and-ink drawing of amorous couples on the pillar brackets of Cave III, Badami, by an Indian draftsman, dated 1853. Badami, formerly known as Vatapi, was the capital of the Early Chalukya rulers in the sixth - eighth centuries. The town is situated between two rocky hills of red sandstone that surround an artificial lake. There are two later forts that overlook the town. Around the south fort there are four rock-cut shrines. Cave III was excavated during the reign of the Early Chalukya ruler Pulakeshin I in 578. It is the finest of the caves at Badami and shows a very elaborate ornamentation. The columns shafts are ornate with sculpted medallions containing amorous couples, jewel and garland motifs. The brackets of the columns of the outer row, reproduced in this drawing, are fashioned as embracing couples (mithunas) or sensuous maidens beneath trees.